In today’s fast-moving world of home entertainment, it can sometimes feel like there’s too many acronyms flying around. From HDR to HLG, ULED and QLED to OLED, and beyond. At Richer Sounds, we are committed to debunk the myth that it’s really all that complicated. The vast majority of new TVs carry a 4K resolution. Basically, this means that the TV is capable of displaying pin-sharp images that are made up of approximately 4,000 by 2,000 dots (or 3840 by 2160 to be precise). It’s how a screen illuminates and displays these dots that makes all the difference. LED TVs come in various forms, with each manufacturer offering a slightly different way of utilising the technology. What they all have in common however are bright and vivid displays. LG, for example, use a form they call Super UHD. Super clear, pin-sharp images. Super vivid screens, with realistic colours. Super wide viewing angles. For the pinnacle of LG’s LED TV technology, look no further than Super UHD. LG’s latest and greatest LED TVs are designed to give the best experience, whatever you’re watching, (or even where you’re watching it from, for that matter)! From the 10-bit picture processing, to the 1 billion colour shades, you can be certain of lifelike images that really “pop” on the screen. The technology goes one step further too, and introduces Nano Cell technology. In a nutshell, this advancement produces wide viewing angles and precise colour reproduction across the whole screen. If you’re like the majority of people who enjoy watching TV at home, you’ll not always be sat directly in front of the screen. In the world of home cinema, we call this best viewing angle the “sweet spot”. Essentially Nano Cell technology, paired with LG’s IPS panels, makes the whole room the “sweet spot”. Colours, contrast and details look just as good from wider viewing angles, so everyone in the room gets the same great experience. Which is even more impressive if you’re watching 4K HDR content from one of the built-in video-on-demand services. Samsung, on the other hand, use a technology they refer to as SUHD. Unlike LG’s Super UHD, Samsung have named their technology exclusively as an acronym. What those 4 letters indicates is a step-up from certified Ultra HD. A regular 4K panel is enhanced using a very fine layer of Nano Crystals. This enables the TV to display a wider range of colours, giving a more lifelike experience. The Nano Crystal technology also helps Samsung’s screen deliver over 1 billion hues and tones, the displays deliver not only a vivid picture, but one that is rich with colour. Samsung combine this with features such as the ability to significantly reduce reflection and glare, which in turn enhances the blacks and shades. It’s this kind of attention to detail that helps the latest range of 4K TVs, from Super UHD to SUHD and beyond, give you the entertainment experience of your dreams. But don’t just take our word for it, pop down to your local store to see these TV in action. LCD, LED, Quantum Dot or OLED – which is right for me? The first thing to work out when you're after a TV is what size you need. If you're not sure, a good rule of thumb is that a TV is slightly less wide than its diagonal screen size. So if you've got a 40" wide space, a 40" TV will fit there! If you look up recommendations for size based on viewing distance you'll find swathes of different opinions so it's best to come and have a look to judge what's best for you. Next is the technology - LCD, LED or OLED. Without getting bogged down in technical mumbo-jumbo, here's a quick run-down of their pros and cons. LCD and LED are actually very similar as the latter is simply a more up-to-date version of the same tech. They're capable of exceptional brightness from fetchingly slim designs whilst keeping power consumption low too. The main downsides are that motion can be slightly blurry and pictures can look washed out if you prefer to watch in the dark. Quantum dot technology is the next evolution in LED technology. Nano-crystals are used in each pixel, offering a much larger range of colours. Combined with a pure white LED, Quantum dot TVs produce much brighter images and more realistic colours. OLED is the new kid on the TV block and, while it's been used for a while in small screens such as smartphones and cameras, big screen tellies are becoming more common. OLED offers incredible contrast, very little blurring alongside massive brightness and low power consumption. I want to know more about OLED! OLED (Organic Light Emitting Diode) is a brand new TV display technology that's capable of incredibly realistic picture quality with very little compromise. So how does it work, and why is it better? OLED screens use a thin film of an organic compound that lights up when electricity passes through it. This means the brightness of every single dot on the screen is controlled independently, so a completely black pixel can be right beside a fully white one, giving punchy dramatic colours with far higher contrast than the always-on backlights found in LED sets. It also offers far wider viewing angles and quicker response times than LED, so everyone can enjoy blur free images. In this respect, OLEDs are more like plasma screens, only much slimmer and more power efficient. OLED's film-like nature can also be used in interesting ways too, including curved screens. While a non-flat TV sounds completely bonkers, it's not as unusual as you might think; most cinema screens are curved to ensure that all the light arrives at its destination at the same time for an incredible immersive effect. So is OLED the holy grail of TVs? Combining the beautiful slim-framed designs and light weight of LED with the contrast performance of plasma while using less power than both, it certainly could be! The technology that goes into making movies and TV shows is always improving. Most films, and even some TV series, are now made at resolutions far higher than the '1080p' we're used to watching on our current sets. The most common of these enhanced signal types is known as 4K, which for a long time has only been available to watch at high-end digital cinemas or on TVs with five-figure prices. Not any more! New Ultra High Definition TVs bring this sensationally sharp picture quality home. Not only does this bring four times the clarity of conventional HD, there's also a huge boost to colour, with the capability to show shades that are simply not possible with the current system. Regular HD, and even traditional standard definition TV shows and DVDs, still look amazing. Thanks to cutting edge processing the image looks smoother and more natural, eking all the detail from whatever you watch. As you'd expect, an Ultra HD TV is bang up to date in every other respect too, with all of the Smart features you'd expect from a top-end TV including easy online access to your favourite TV shows and movies, voice control and Skype video calling capabilities to name but a few. Get ahead of the curve with an Ultra High Definition TV and be ready for unparalleled picture quality. What makes a 'Smart TV' smart? In a nutshell, a Smart TV is one that can connect to the internet. No more huddling 'round a laptop to watch BBC iPlayer, now it can take the pride of place it deserves on your main TV. It's not just BBC iPlayer, though - other video services are available including Netflix and Amazon Prime. You may never have to buy a disc again! A Smart TV can also set free videos, music and photos stored on a computer, smartphone or tablet. Most models will automatically show content in the shared folders of your desktop or laptop computer, so you can instantly enjoy it on a big screen. If you own a smartphone or tablet, things get even more clever, with apps that allow you to instantly beam to your TV - definitely a better way of sharing your holiday snaps than a small phone screen. You can also use these apps as swanky touchscreen remotes and the most advanced take system control to a whole new level, allowing you to control the set with your voice or even hand gestures. One very cool feature we're seeing more of in Smart TV is recommendation, where just the touch of a button or simple voice command brings up a list of personalised programmes recommended just for you! If you often find yourself channel-hopping and watching repeats, this could be just what the doctor ordered. Smart TVs allow you to make the most of your new purchase, with more stuff for you to watch and straightforward easy-to-use interfaces. If you want to see how it works for yourself, just pop down to your local store who'll be more than happy to show you. Are projectors as good as TVs? A lot of people think that projectors don't have the picture quality to match a television so the only advantage you're getting is a massive screen size. This simply isn't the case, as even modestly priced projectors will trade blows with price-equivalent TVs. More advanced models, like those from JVC, achieve astounding picture quality that gives the cinema a run for its money! 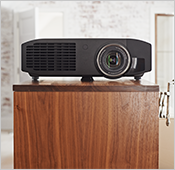 You won't miss out on current trends either - nearly all of the projectors we do are capable of showing 3D and the effect is much more impressive than on the relatively small screen of a television. For the ultimate big screen experience, 4K will bring out every detail of the action. You can get a taste of the experience yourself in our demonstration rooms, which all have projectors set up and ready to blow you away. We'll also be able to show you home cinema systems that give sound to match the picture for a rip-roaring performance that brings TV shows, games and movies to life. 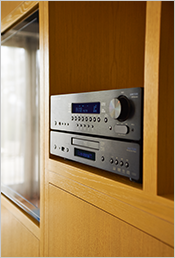 An AV receiver is not just an amplifier, it's more of a home cinema hub. It connects to your TV, your speakers and your sources (Blu-ray player, set-top box, games consoles etc. ), and makes sure the right picture's on the TV and the right sound comes out the speakers. In addition to making sure you get incredible surround sound most models can improve picture quality too. A current major trend is networking and streaming capabilities, so your receiver can access internet radio, play music wirelessly from your phone and more. It may well be that your TV or Blu-ray player has this functionality too, but these are optimised for video and photos, not for tip-top sound quality. What's really cool is being able to control these functions intuitively from your smartphone or tablet's touchscreen. If all this sounds too complicated, don't worry as AV receivers are easy to use. Setting them up can a bit of time, but thankfully is mostly automated, with guides that take you through the process step by step. For the ultimate piece of mind, we can take care of installation for you and walk you through how it all works once it's primed and ready to go. 5.1 systems feature six speakers dotted around the room, surrounding you with sound, for cinema action that leaps out at you. Surround left and right speakers provide ambient atmosphere and 'it’s behind you' sounds; front left and right speakers provide a clear stereo soundstage for action and a centre speaker, mounted directly above or below your TV, is there to make sure dialogue is clearly audible and feels like it’s coming straight from the talking heads on-screen. The extra .1 in the mix? The subwoofer – ideal at producing the heavy bass noises smaller speakers can’t. This system adds two extra rear speakers for more accurate and subtle positioning of effects. Alternatively, you can place the additional speakers high up above your front speakers or further apart either side, known as 'height' or 'wide' front speakers. The idea of these is to make your room sound like a much bigger space than it actually is, that is to say more like a cinema! When amps start going up to 9.1 or 11.1, this means using height and/or width speakers, as well as the extra rears for the ultimate in immersion. Whenever you see a .2 this means more subs are getting involved, giving a massive boost to bass - perfect for fans of big explosions. Dolby Atmos and DTS:X take surround sound to the next level – speakers are positioned both around and above the listener to truly transport them to the heart of the action. What are TV soundbars and sound bases? Traditional 5.1 and 7.1 multi-channel speaker systems remain the top choice if you’re looking for the very best surround sound experience, but if you want to avoid the complexity, cost or space implications of a full surround system, there are alternatives – the soundbar and sound base. The subtle soundbars mount above or underneath your TV and have much higher quality and more powerful speakers than you’d find inside a flatscreen TV. This allows for a much more immersive and engaging sound, especially when a subwoofer is included to take care of deep bass sounds. 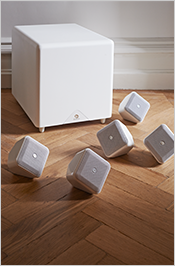 Some models employ multiple, angled speakers, which 'bounce' sound around the room to give the impression of surround sound. Sound bases are designed in a similar way, but are large enough to sit your TV on. This allows them to have a much bigger speaker built-in, often not needing the subwoofer. Neither sound quite as impressive as a full home cinema amp and speakers set-up, but are serious alternatives if you’re limited for space. Come and ask for a demo if you’re not convinced!